The car that we know as the Volkswagen Beetle today began as the brainchild of Dr. Ferdinand Porsche. In the 1930’s he began working towards production of a practical automobile, which the average German could afford. He took some of his inspiration for the idea from Henry Ford’s Model T; a car which sold for as little as $500.00 by the 1920’s, and which was seen everywhere on America’s roads. Porsche contracted with two different companies, one after the other, to produce his affordable car. The contract with Zundapp fell through due to the production costs of the car and their desire to concentrate on motorcycles. The contract with NSU came to an end when they noticed a contract with FIAT where NSU agreed to not produce automobiles. In the end Dr. Porsche founded his own design firm and on January 17, 1934 he published his “Expose”. The Expose discussed the concept of a practical affordable car for the people. This caught the eye of the German government and shortly after Dr. Porsche found himself in a meeting with the Chancellor, Adolf Hitler. Hitler had his own ideas for a people’s car. The years following this meeting would be a time of development and compromise as Dr. Porsche’s team worked with government support on creating the car we know as the “Beetle”. There were several series of cars tested through the mid to late 1930’s. 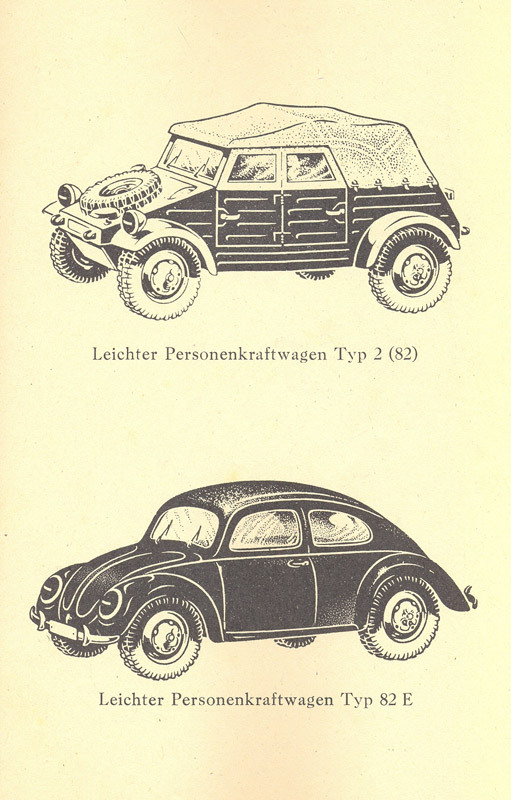 The series had such names as the V1, V2, V3 and VW 30. By the time of the factory cornerstone laying in 1938 the basic Beetle had come into being. This car had lost its Tatra-esque rear louvers in trade for a rear window, and had gained such amenities as running boards and forward hinged doors. Mechanical changes are too numerous to discuss here. Hitler surprised the project team by renaming their Volkswagen at the factory cornerstone laying. He renamed it the “KDFwagen”. The KDF initials translate into “Strength-Through-Joy”. The government created a savings program for the German people. The average person could purchase a savings book in which they could purchase a five Reichmark stamp each week. A few hundred thousand Germans enrolled in this program. On September 1st, 1939 Germany invaded Poland and WWII began. The stamp savers would never receive their cars or their money back. 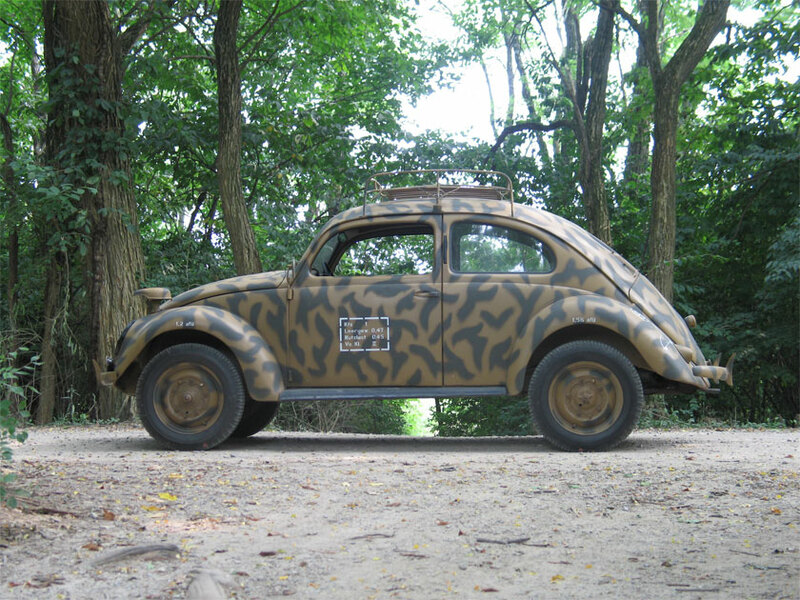 Very few KDF type 60’s (the Beetle’s new designation) were produced during WWII, and those that were went to high-ranking Nazi party members. The VW plant bosses handed the plant over to the government in 1939 so as to speed up production on facilities but compromising to allow the production of other war materials at the plant. During the war production ranged from vehicles to stoves to V-1 rockets. Production began at the plant on the military type 82 (Kubelwagen) between May and August of 1940. Ambi Budd produced the bodies for these Spartan vehicles and delivered them to the factory. There the bodies were mated to a KDF chassis similar to the basic type 60 chassis. The Kubelwagens had lower gearing and rode higher. Around 50,000 were produced during the war. The type 82E (also known as the type 92 and postwar as the type 51) was the mating of a type 60 body to a type 82 chassis. The result was an off road Beetle. These vehicles appear under various designations. One 82E was a prototype body mounted onto a handy 82 chassis. Another was mistakenly listed in papers as a pickup. Two 82E’s were specially produced for a Berlin to Kabul Afghanistan run. These 82E’s had extra ventilation, fans, blinds for sleeping and more. They had roof racks and were loaded front tall smallwith everything from tools and spares to camping gear and a short wave radio. The two 82E’s and occasional companion type 82 made their way from Berlin May 27, 1941 and arrived in Kabul on June 26. They never made the return trip home as Allied forces had moved into Iran. The cars were probably destroyed to keep them from falling into enemy hands. There are very few other records of 82E’s. As for their use they seem to be mainly heavy-duty staff cars. One that resides in the United States was used by Herman Goering’s staff office in Paris. Another survivor in Europe served on a border patrol. When I received this car I knew nothing about its history other than it took an award at the Military Max show in the early 1990’s. I was also told a wildly erroneous story about its background. The Erroneous story went as follows,” originally assigned to the SS Nordland Division as a staff car it was found in the Templhof district of Berlin 1945 covered with boards as protection from the bombing and the rubble. 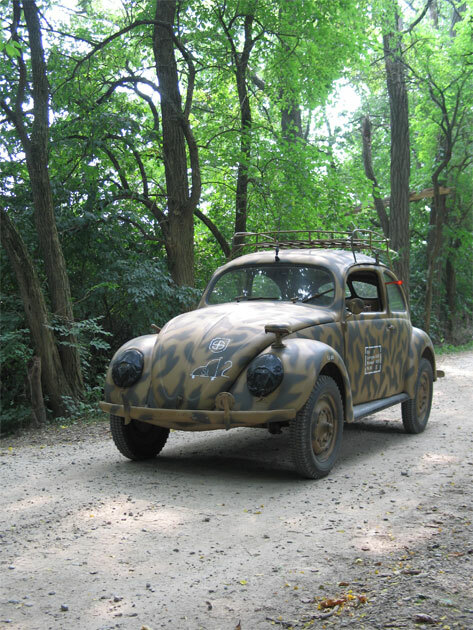 Located by Captain Connors US Army of Occupation it became his personal car while stationed in Berlin…” this twaddle goes on to describe how the car somehow maintained its original paint through all of this etc. etc. Well, the Canadian museum selling this from their storage had no provenance to back this up, so I set out to find the true story behind this car. Through extensive research, tracking and contacting former owners, and assistance from other early VW enthusiasts I have managed to gather quite an amount of provenance on this car. To begin with, Mr. Connors would have to have been a wildly precocious four year old to have found the car in Berlin circa 1945. He was born in 1941. I also found that many of the museum’s other claims were false as well. Overall this was a learning experience in making sure that anyone making claims about a vehicle has the paperwork to back them up. Mr. Connors provided me with a great deal of information about the car. 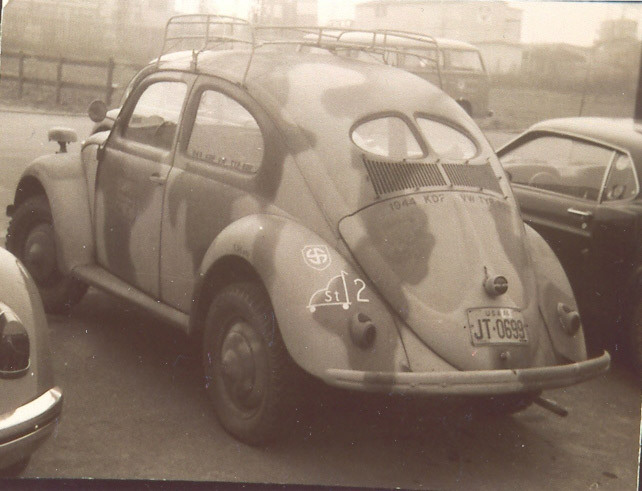 My 1944 KDF 82E was delivered to the German Military acceptance point in Koblenz in 1944. The Waffen SS and the Home Land Defense Forces received most of their vehicles through this distribution point. 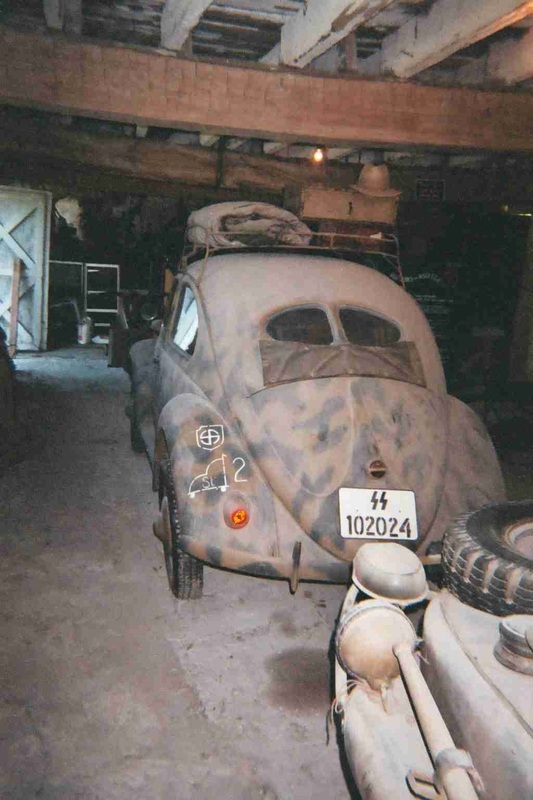 Mr. Connors discovered the car heavily damaged amongst many other wartime VW’s in an Austrian junkyard in 1964. (Sadly, in the early 1970’s he went back to purchase whatever was left in the junkyard only to find everything had been crushed.) The car was smashed in the left side and the rear window had been made into an oval. The metal glove boxes were rusted out as well. He traded a five-gallon can of U.S. Army OD green paint to the junkyard owner for the car. 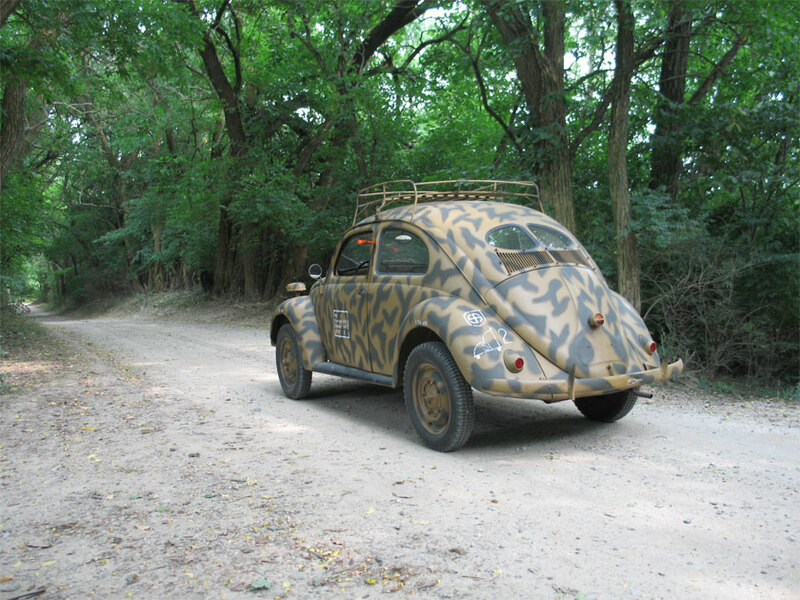 Mr. Connors had several other wartime VW’s. 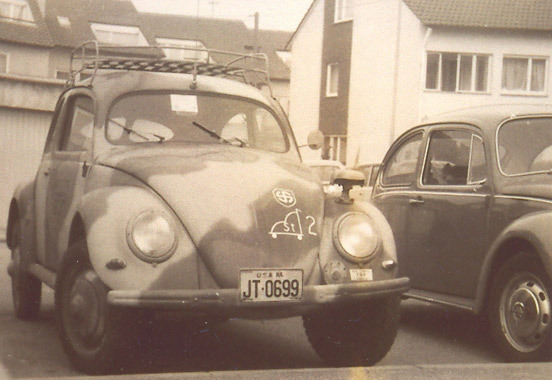 This car served as his daily driver while he was stationed in Germany. He described driving it between Luxemburg and Vienna regularly. One time, when trapped in a heavy snowstorm, he managed to dig the car out and drive it in the ruts of German army trucks while all other cars were still stuck. The car appeared in March of 1976 in an article by Chris Barber (the black and white photos are from that article). This article was written for the small club magazine "Beetling". Mr. Barber notes that this was back in the days before much of the early history of VW was known so such articles are somewhat inaccurate. Shortly after that Mr. Connors sold the VW to a fellow from Long Island. Mr.Kennedy Ward had met Mr. Connors in Germany and had ridden in the car prior to its sale. Mr. Ward eventually placed an advertisement with a picture of the car in Hemmings. He offered to buy the car if anyone knew where it was. A man who had purchased the car from the Long Islander contacted Mr. Ward shortly after the ad was listed. The new owner was a Mr. Lloyd in Connecticut and he wanted to sell, partially because he could not get the car to shift gears. Mr. Ward bought the car and soon called in Mr. Connors to help him get it going again. The now stateside Mr. Connors found that someone had filled all the gearboxes with automatic transmission oil. Once that was changed out everything ran smoothly again. My ex-wife and I found the car on a return trip from Toronto in August of 2004. We were traveling with friends who wanted to look at another vehicle that the CMSM was selling. It turned out that the museum was selling off the remains of its vehicle collection, all of which was stored in a dusty barn. Imagine my surprise when I strolled into the barn and saw an 82E sitting in front of me. My 82E sat between a Kubelwagen and a Shwimmwagen. Behind the Schwimm was a Kettenkrad. On the drive home we decided to purchase the 82E. Since the delivery of this car I have worked on reviving it mechanically (it was not run regularly). Much of the rest of my time was spent tracking down the truth on this vehicle. And now we have it. The future for this car consists of rebuilding a wartime KDF engine for it, and slowly going through and addressing deterioration issues and authenticity issues which can be corrected while remaining true to this vehicle's convoluted history. As of August, 2006 I took the vehicle for its debut at the Kubel Korps reunion in Camden, Ohio. I drove the 82E all over the encampment that the Kubel Korps rented, and even took it on an off-road night convoy. I was surprised at how well the car handled, and how well it ran after all my work. I am sure the car was happy to be among its wartime friends again. I even took a couple photos of the 82E parked next to a Kubelwagen which Kennedy Ward had owned. The Kubel Korps folks are wonderful, and the group is well worth joining if you have a wartime KDF vehicle, be it Schwimmwagen, Kubelwagen or other. The members, and especially David Crompton, have been extremely helpful with our work on this car. A final note, sadly Mr. Ward passed away in 1999. He apparently really loved the car and I will maintain it and enjoy it with him in mind. This site has some excellent detail pictures of an 82E. an informative site about Schwimmwagens. 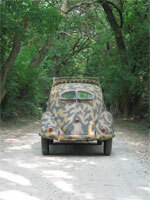 Many great articles, and a wartime VW forum. Great website for information and parts. A wide variety of VW information. regular contributors to early Beetle elists. Split 49. They reproduce parts for splits from early 1949 back. These folks carry parts for early Beetles and Kubelwagens. Mr. Krebernik comes highly recommended, though I cannot figure out his new website. Information and parts. Historical Parts and Militaria Co.
Blitzbikes parts for Kubelwagens and Schwimmwagens.